Gymnosperms are the “naked seeded” plants. They do not produce flowers, hence no ovaries completely enclosing ovules, and no fruits completely enclosing seeds. These are the cone-bearing plants, producing uncovered (naked) seeds in pairs at the base of female cone scales. Gymnosperms are woody plants, mainly needle-leaves evergreen trees that are monoecious (bearing unisexual structures on different parts of the same plant). Here’s a pine (alas, a cultivated species, Austrian pine, Pinus mugo) that demonstrates the signature features of conifer reproduction. First, see a branch with pollen-producing cones. 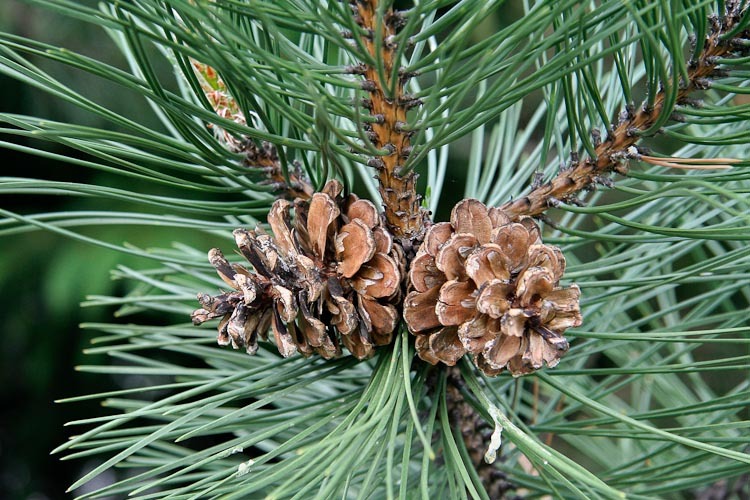 Pollen-producing cones of Austrian pine. Uniquely among our conifers, pine (genus Pinus) reproduction takes two years. During the beginning of the first year, at the same time that the male cones are sending clouds of yellow pollen into the air (ha-choo! 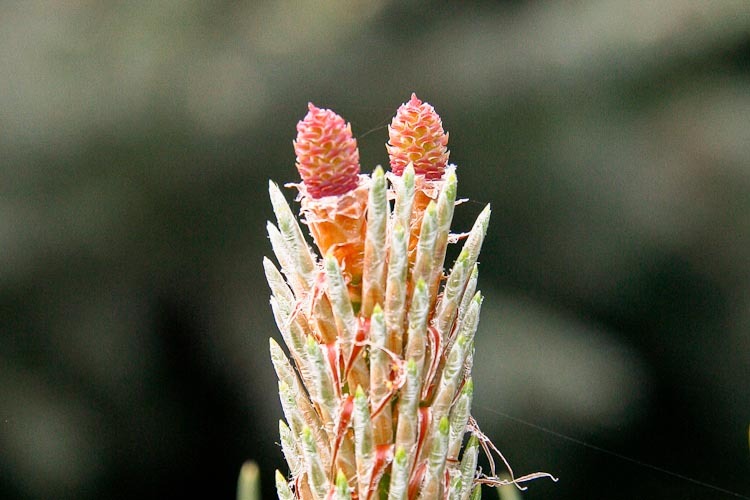 ), the newly-formed female cones are teeny-teeny tiny-tiny little things, barely distiunguishable from ordinary branch tips. Austrian pine ovulate cone at beginning of year one. Pollination occurs at this stage. Some lucky pollen grains that happen to land on a drop of sticky fluid produced by the female (ovulate) cone get drawn into the cone, where they remains dormant for a year. During that year, small multicellular gametophytes –two per cone scale –develop within the cones. These 1-year old cones are medium-sized, greenish, and tightly closed. Austrian pine cones at beginning of 2nd year. Pollination occurred the year before. Fertilization occurs now! At the beginning of the 2nd year, fertilization (egg + sperm -> zygote/embryo) occurs, using pollen grains that were sucked into the cone the previous year. 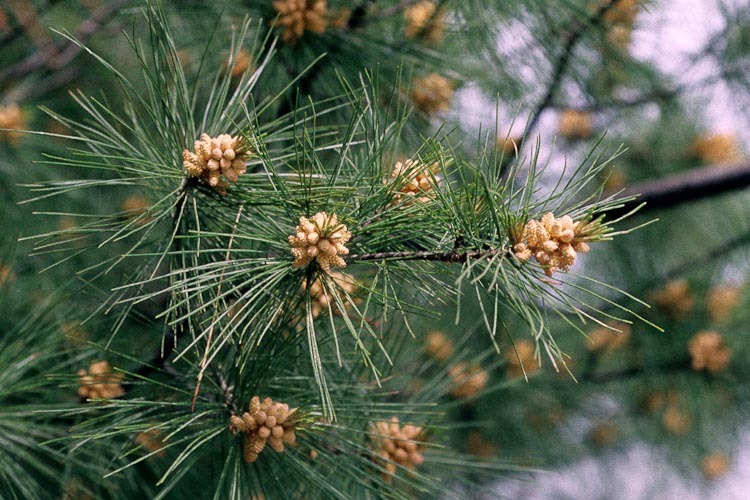 Thus in pines there’s an interesting peculiarity in timing: pollination and fertilization occur an entire year apart! At the beginning of the second year, sperm from the pollen grains that were captured one year ago fertilize the egg in the gametophytes at the bases of the scales, which develop into winged seeds in pairs at the bases of the scales. The cone scales separate and the winged seeds drift away at the end of the second year. By the time we tend to notice them, the familiar dark dry woody pine cones have released their seeds, although careful examination (MOVE ARROWS) will sometimes reveal a few stuck seeds remaining. Austrian pine at end of 2nd year. Cone scales have spread apart and released the winged seeds. 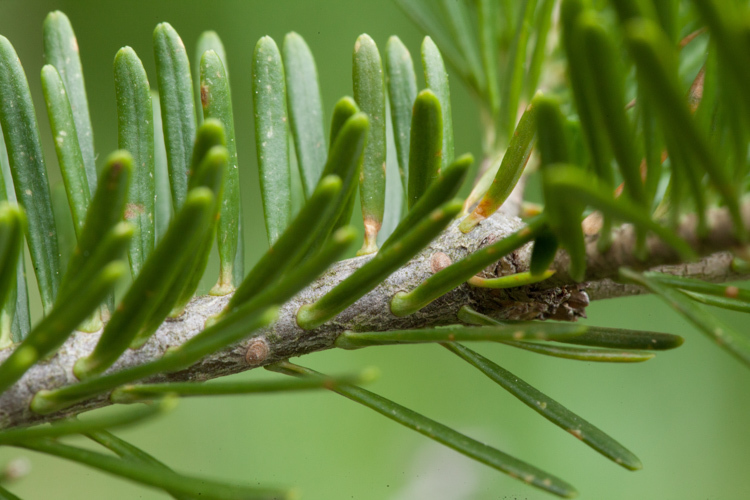 Ohio is home to six genera of native conifers: yew (Taxus), Pine (Pinus), Larch/tamarack (Larix), hemlock (Tsuga), northern whitecedar (Thuja), and redcedar (Juniperus). These and several others, especially spruce (Picea) and fir (Abies) are planted as ornamentals, some very widely and abundantly. Yew (Taxus, family Taxaceae). One Ohio conifer doesn’t produce cones. Taxus (yew, in the family Taxaceae) seeds are instead borne singly and look very berry-like, as they are provided with a fleshy covering at maturity. The fleshy part is a highly modified seed cone scale. Here’s what a yew seed looked like in mid-summer several years ago. This is one of several very commonly planted ornamental Taxus species, perhaps English yew (T. baccata) or some Asian species. The native yew, T. canadensis, is an uncommon shrub in the understory of rich deciduous and mixed deciduous-conifer woods, occurring mainly in the northeastern portion of the state. 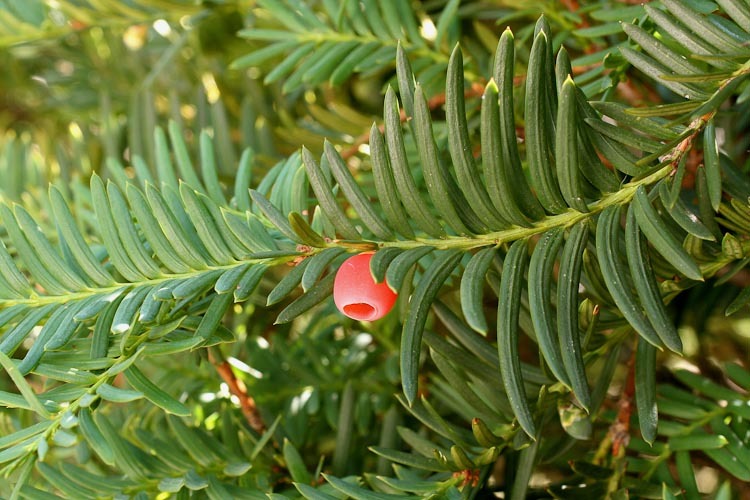 Yew is indeed a gymnosperm (i.e., “naked-seeded”) plant. Note that the seed is not enclosed by this fruity-looking structure; it is merely surrounded by it. 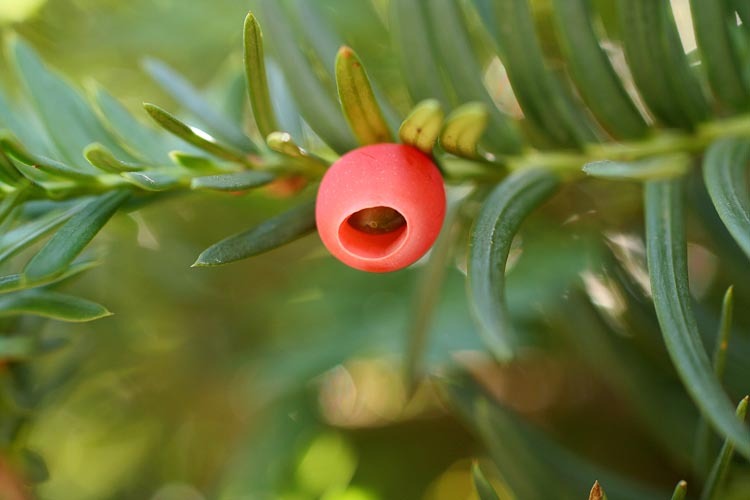 Yew produces its seeds singly, not in cones. 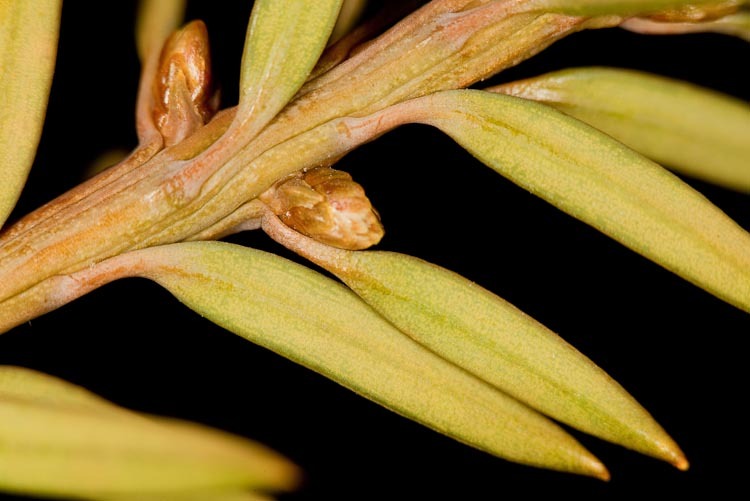 Yew twig: leaves are flat, attached singly, with pale lines of stomates. Eastern hemlock (Tsuga, family Pinaceae). Eastern hemlock, Tsuga canadensis, is a native Ohio member of the Pinaceae that is locally abundant in cool ravines in unglaciated southern portions of the state. Eastern hemlock in a cool ravine in Hocking County. It’s also a beautiful lawn ornamental. Here’s one in the Clintonville neighborhood of Columbus. 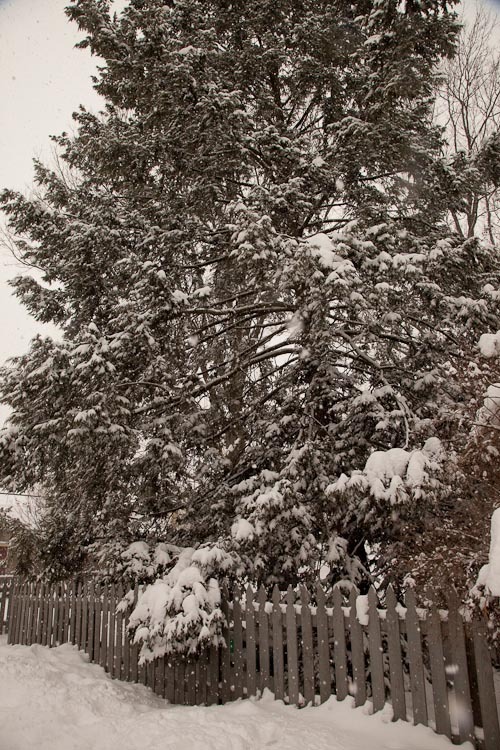 Eastern hemlock is a popular ornamental tree. Eastern hemlock leaves are flattened, and attached singly. The seed cone are small. They ripen in autumn and release their seeds during autumn and winter. 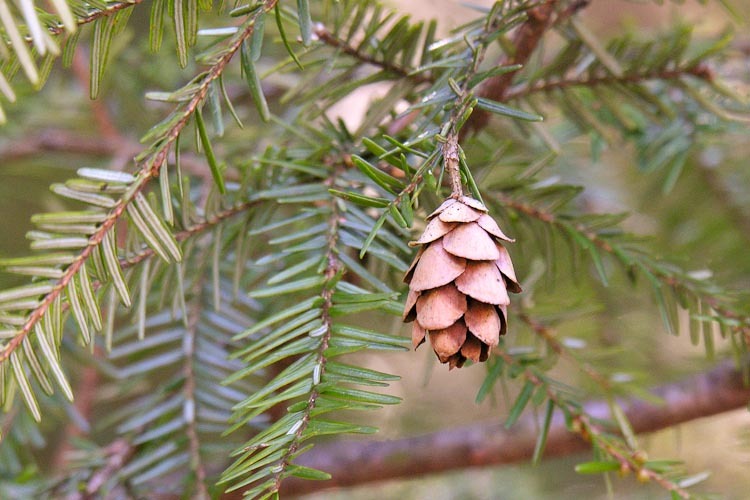 Eastern hemlock produces small pendant cones. 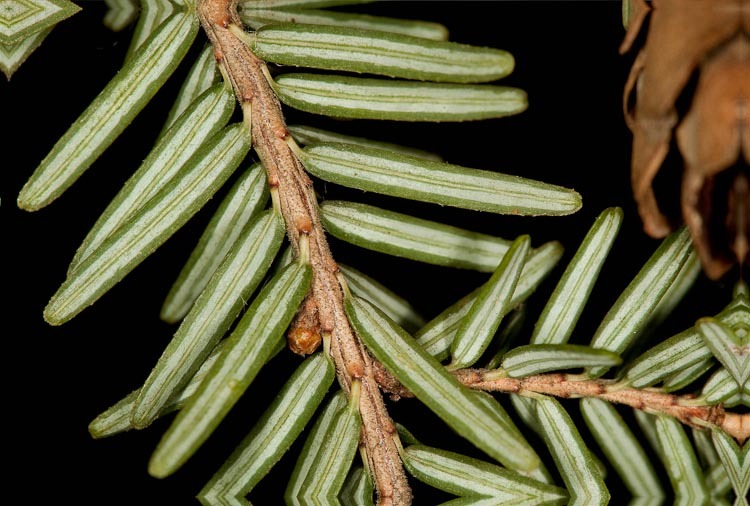 Eastern hemlock leaves are spirally arranged around the twig, but the upper and lower ones are splayed sideways, resulting in flattened sprays of foliage. Prominent paired white lines of stomates (breathing pores) mark the underside of each leaf. 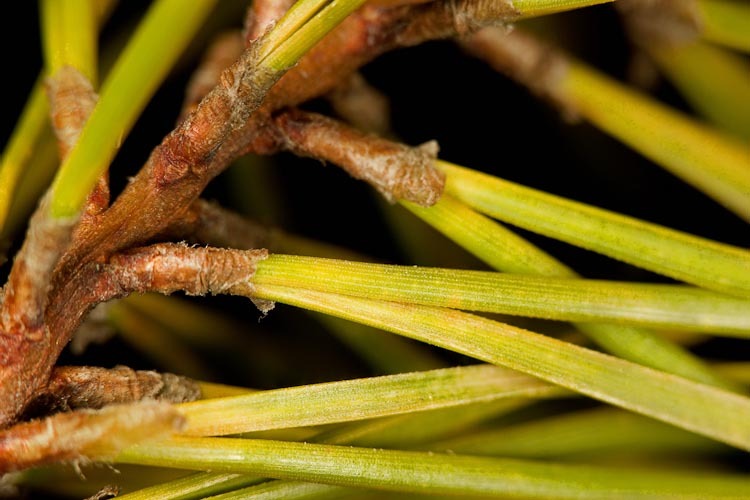 Eastern hemlock twigs have a rough appearance owing to persistent leaf bases lying alongside the twigs. and marked beneath by two prominent lines of stomates. Pine (genus Pinus, family Pinaceae). When most people think of conifers, they think of pine (genus Pinus in the family Pinaceae), although a spruce or fir is very likely to be called a “pine tree” by somebody not yet familiar with the fine points of plant identification. Pines are needle-leaved evergreens, the leaves of which, except those of a Great Basin species aptly named Pinus monophylla, are bundled together in sheathed fascicles of 2-5. 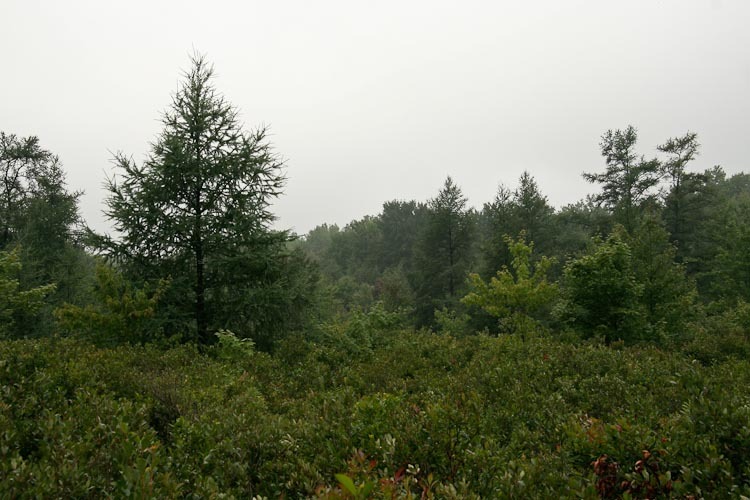 There are only four native pines in Ohio: shortleaf (P. echinata), pitch (P. rigida), white (P. strobus), and Virginia pine/scrub pine (Pinus virginiana). Here’s Virginia/scrub pine. This species, a typical “southern yellow pine” naturally occurs in dry open areas in the southern (unglaciated) portion of the state. 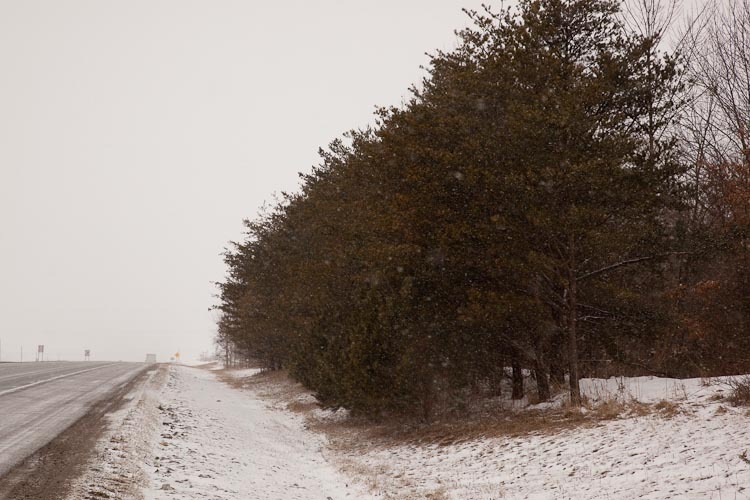 TheseVirginia pines are planted along a roadside in north-central Ohio. Virginia pine along a roadside in central Ohio. 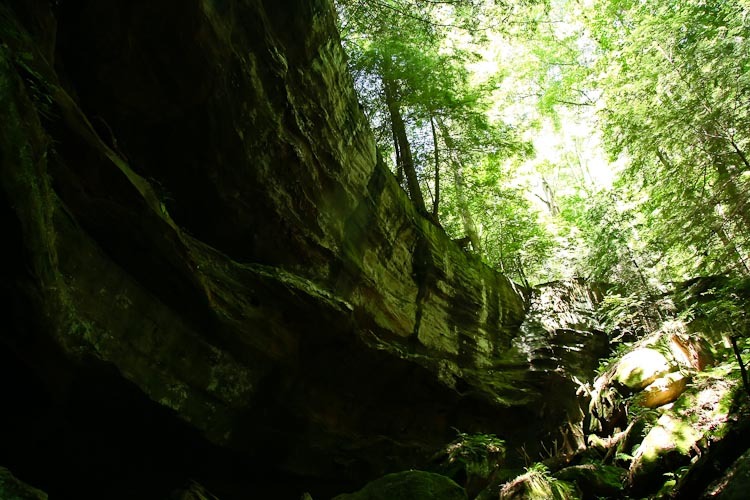 The species is native to unglaciated southeastern Ohio. Virginia pine seed cone scales are distinctively spine-tipped. The leaves are short, and bundled in twos. Virginia pine needles are in bundles of two, and the cone scales are pointed. Closeup, it is evident that the leaves are in bundles (fascicles) enveloped at their bases by a papery sheath. 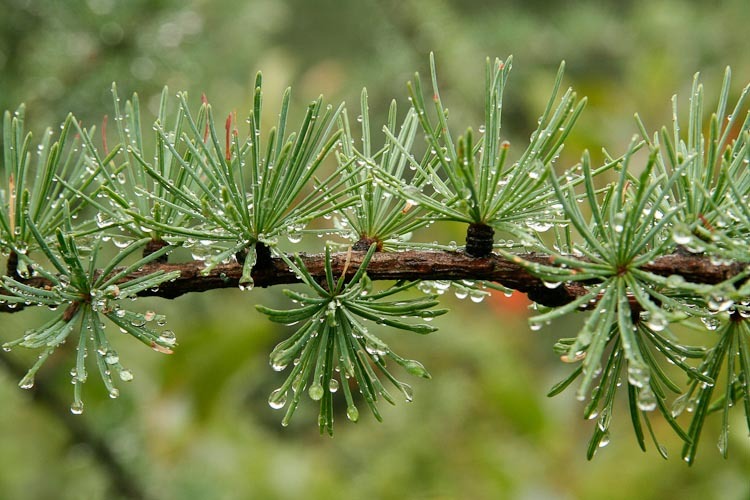 Virginia pine leaves are in fascicles of two leaves each. 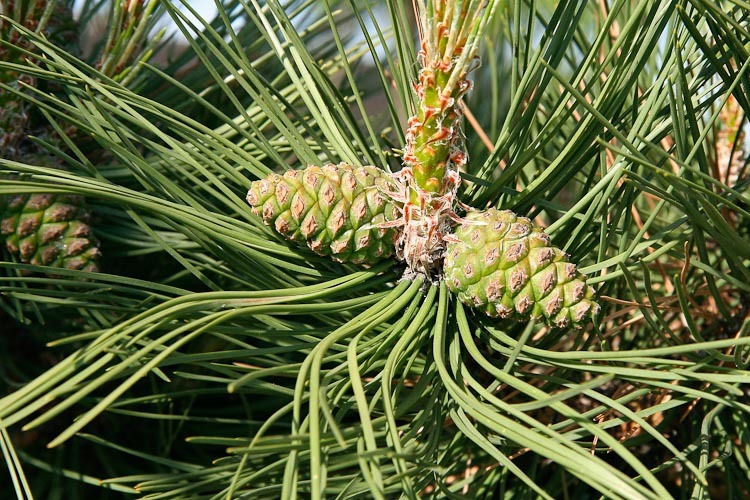 So called “soft pines” are species with needles in bundles of 5. In the eastern U.S., the only soft pine is eastern white pine, Pinus strobus, a sometimes massive tree that occurs in moister, less exposed sites than do other pines. In Ohio, white pine occurs principally in the northeastern part of the state. 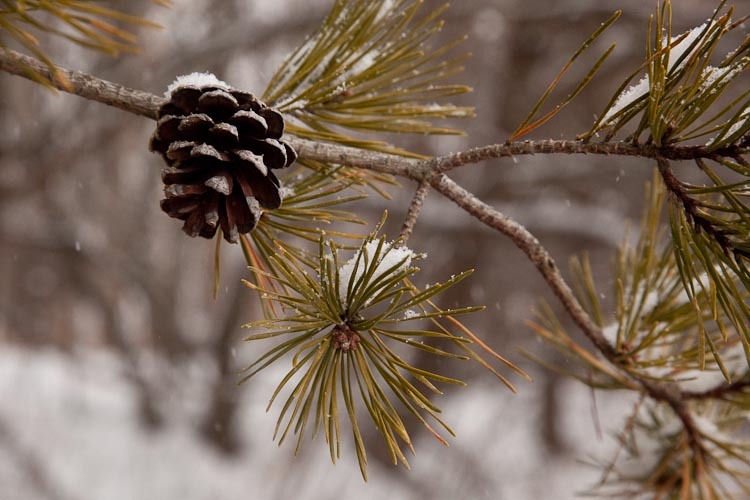 Eastern white pine is our only soft pine. The needles are long, thin and bundled in fives. Larch/tamarack (Larix, family Pinaceae). Eastern larch (also called “tamarack”) is principally a far-northern North American species, something of a rarity in Ohio found only in a few kettle-hole bogs and similar saturated acidic soils in the northeastern and northwestern corners of the state. The photo below was taken in a nature preserve near in Summit County, near Kent. 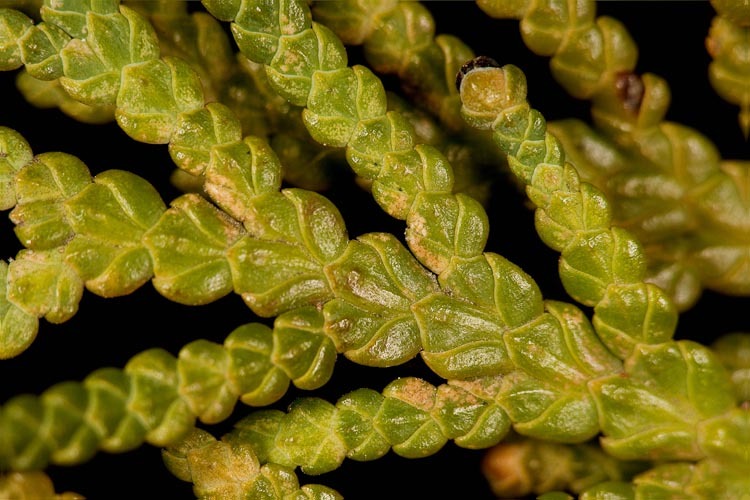 Larch is found in acid bogs, remnants of immediately post-glacial periods. 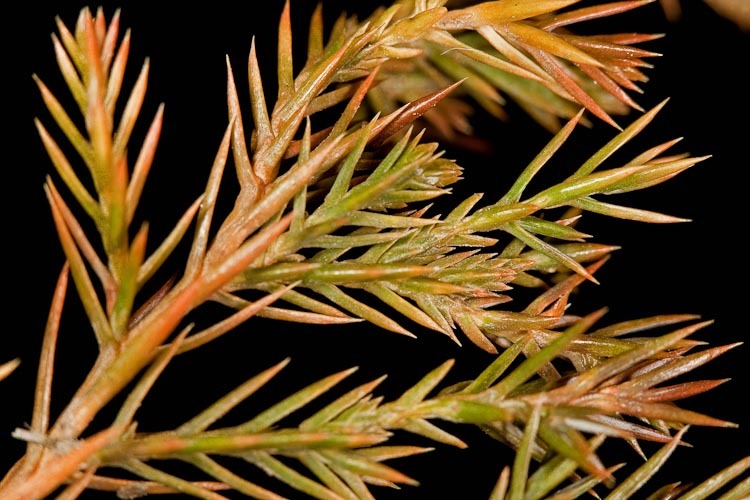 Larch needles are short and delicate, in fascicles of many leaves each. Larch is a deciduous conifer with delicate leaves in fascicles. Spruce (genus Picea, family Pinaceae). 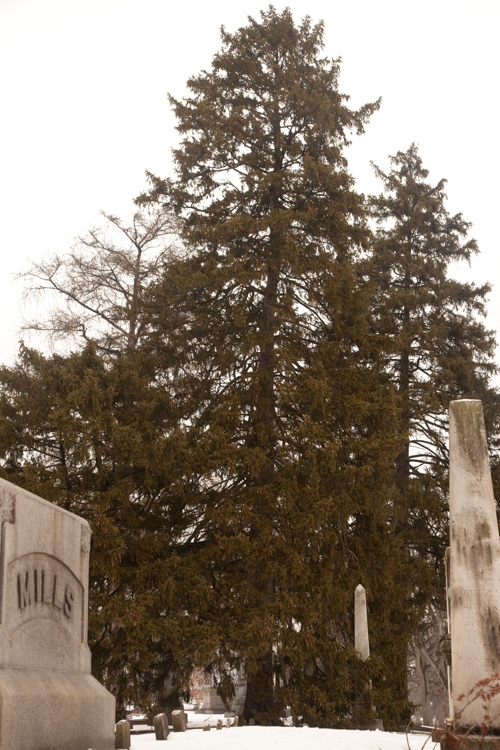 Spruce is not native to Ohio, but certainly occurred here while the glaciers receded. It wouldn’t have been surprising if a few black spruce were to have happened to occur in kettle-hole bogs alongside larch as is common in bogs in neighboring states, but, alas, that didn’t happen. Nonetheless, several spruces are very popular ornamental trees, so most people, while they are out and about in residential areas, will see spruces every day. The most common of these is Norway spruce, Picea abies. It’s the tall dark conifer with the drooping side-branches. Norway spruce is a common ornamental tree. 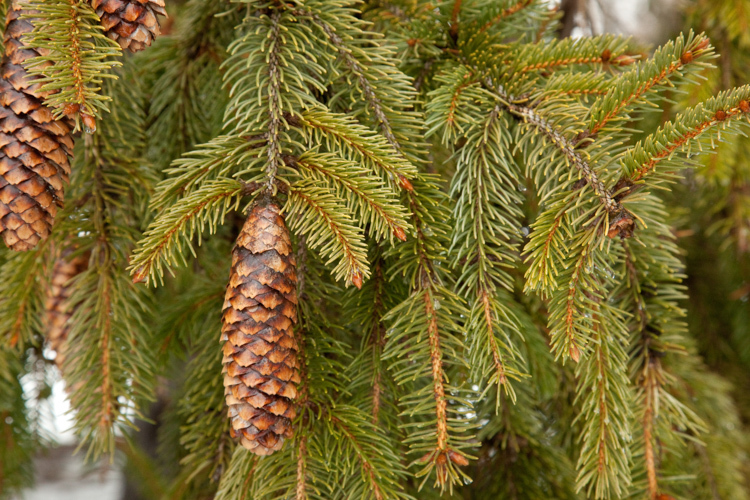 Spruce is distinguished by having leaves (needles) that are attached singly (not in bundles as in pine and larch), and the are 4-angled and sharp! (Ouch!) They are attached to the stem on little woody pegs. Spruce cone are pendant (hanging down). Norway spruce cones look like cuckoo-clock chain weights, don’t they? Here’s what a native North American spruce looks like. It’s red spruce, from the mountains of West Virginia. Red spruce in West Virginia. Fir (genus Abies, family Pinaceae). Un-fir-tunately, the genus Abies is not native to Ohio although balsam fir (A. balsamea) does occur in nearby West Virginia. Also, firs are planted as ornamentals, but not nearly as often as spruces. 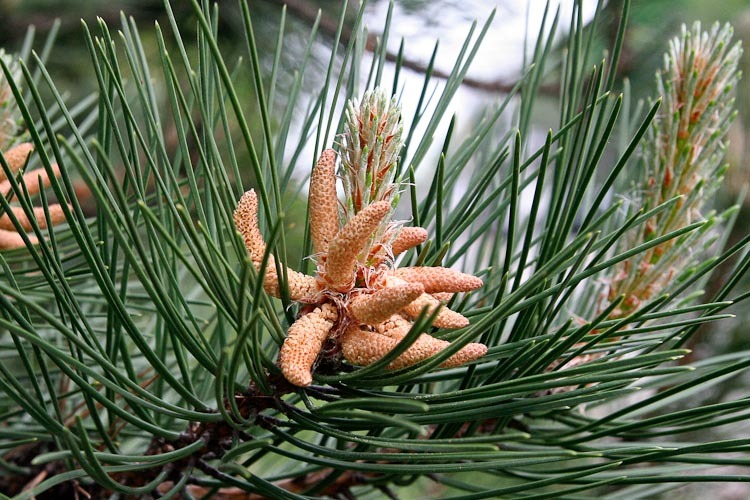 The diagnostic feature of fir is that the leaves (needles) are attached singly as in spruce, but that are more or less flattened, soft-tipped (no “ouch”) and attached to the twigs on an expanded round base that looks like a little suction cup. 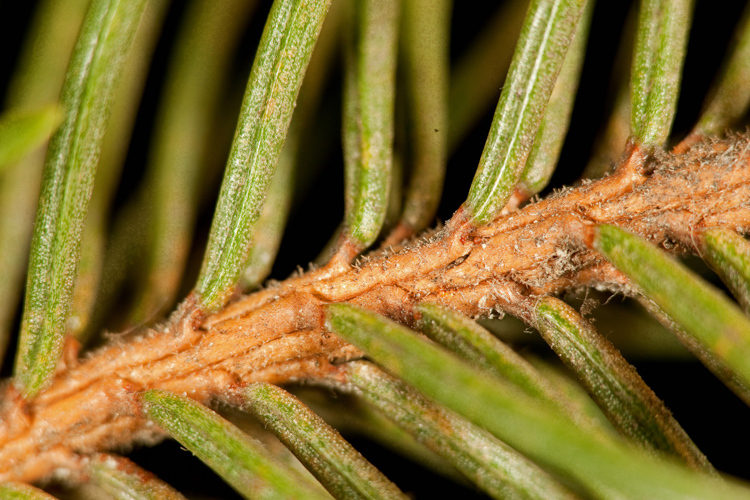 Fir needles are attached by a swollen base, like a suction cup. Rather than being needle-leaved, our members of the cypress family have leaves that are short and scale-like as in white-cedar (Thuja), or short and pointed like an awl as in redcedar/juniper (Juniperus). 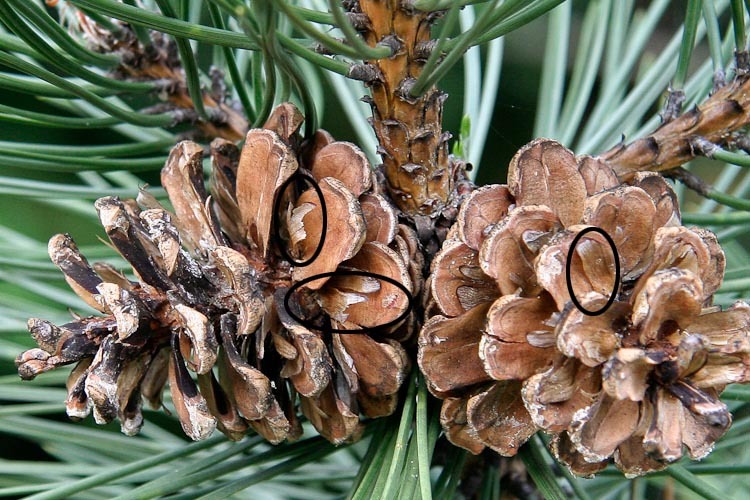 The cones are either dry and cone-like as in white-cedar, or berry-like as in redcedar/juniper. 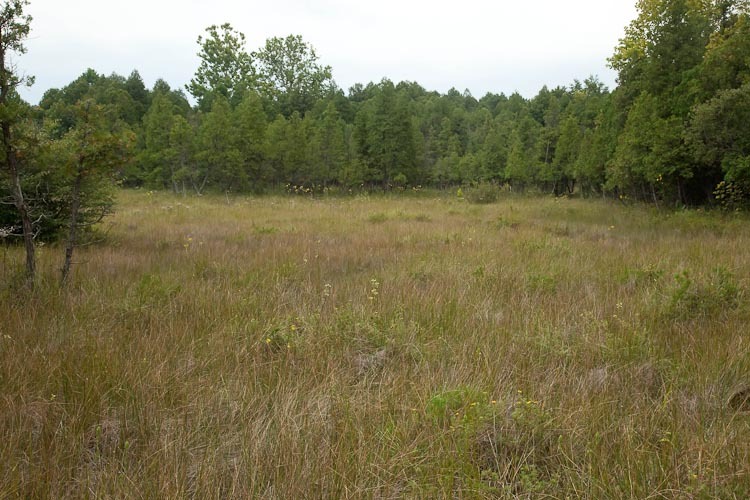 Cedar Bog Fen is dominated by northern white-cedar (Thuja occientalis). 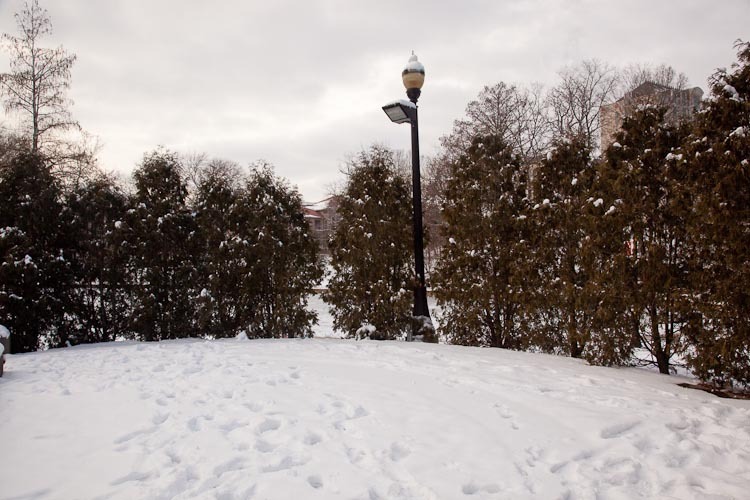 Closer to home (for an OSU student), Thuja can be seen planted at the periphery of that little outdoor amphitheater right next to Mirror Lake. 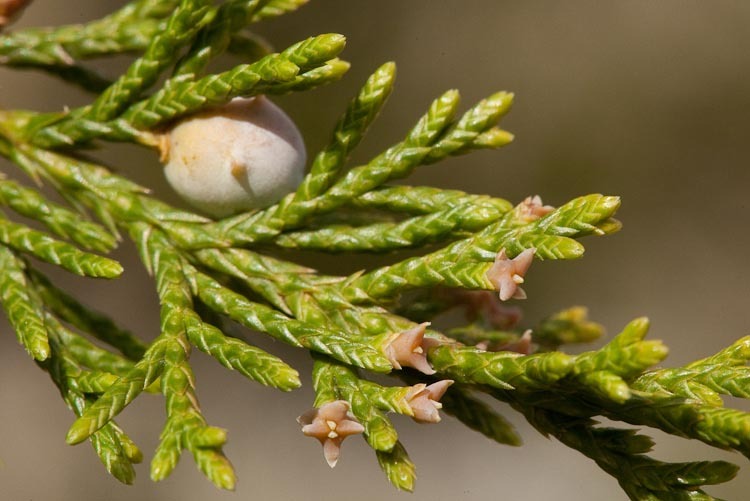 Northern white-cedar is a commonly planted ornamental small tree. Northern white-cedar foliage is in flattened sprays, with small woody seed cones that are presented upwardly-pointed (erect). 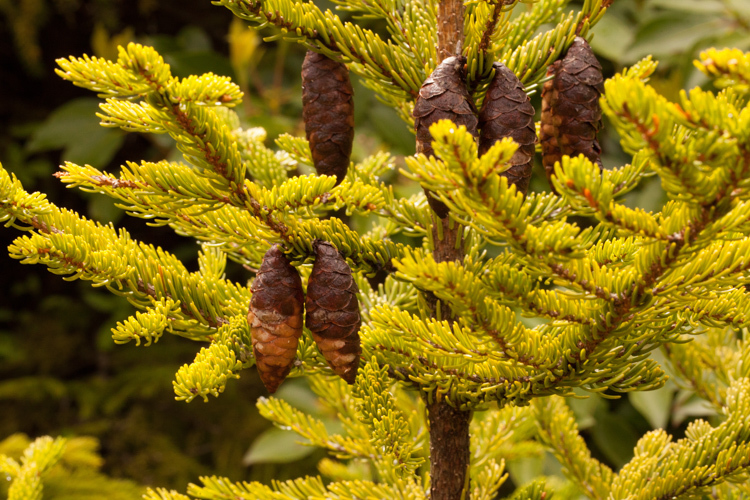 Northern white-cedar produces small erect seed cones. The leaves of Thuja are “decussate,” meaning that they are arranged in opposite pairs that are perpendicular to one another. A further distinction is that the upper and lower leaves are flat, but the lateral ones are folded over, clasping the upper and lower ones. It reminds me of someone holding a big hamburger with both hands: the buns are the flat upper and lower leaves, while the hamburger-holder’s fingers and opposable thumbs represent the folded side leaves. 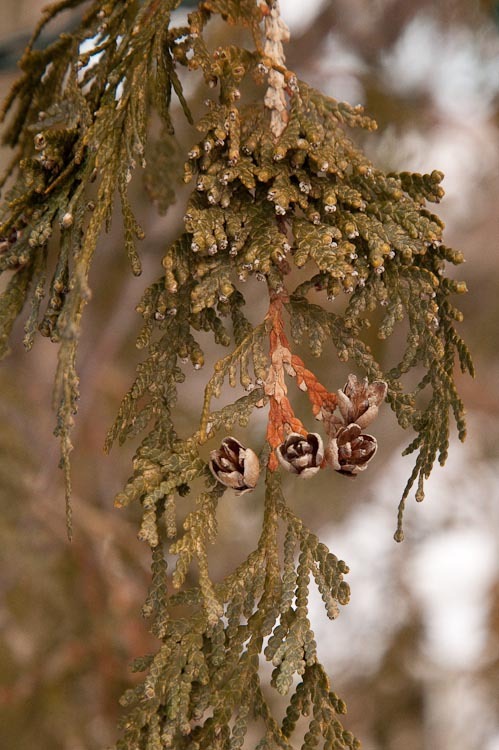 Northern white-cedar leaves are cale-like, in overlapping oppositely arranged pairs. Redcedar/juniper (Juniperus, family Cupressaceae). 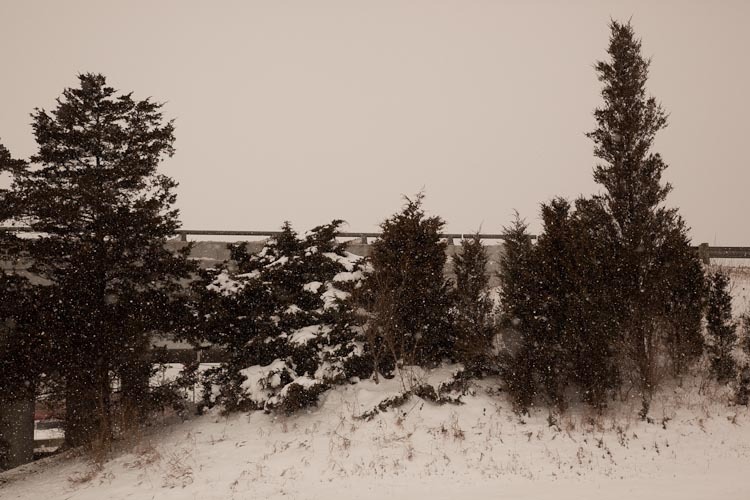 Juniper, Juniperus virginiana, also called eastern redcedar is an extremely common and abundant conifer, especially in areas with calcareous soil. It has a distinctively dark pyramidal form, commonly seen scattered in old fields, where it is a pioneer in secondary succession. 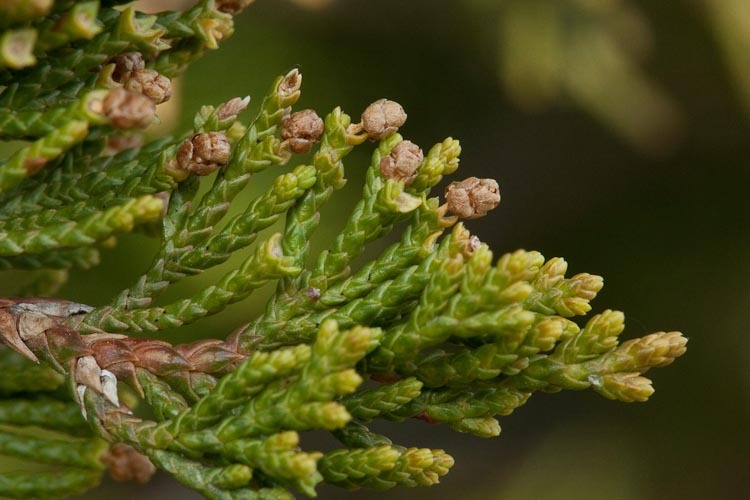 Eastern redcedar is a widespread conifer that grows in dry open areas. Redcedar foliage changes as its branches get older. Young branches have projecting, sharply awl-shaped leaves. Young branch of redcedar, kinda spikey! Older branches bear scale-like leaves that are pressed tightly against the stem. Below, see an older branch on a tree that happens to be male. Note the globe-shaped pollen cones. Older branch of a male redcedar: note the appressed scale-like leaves, and pollen cones. Unlike most other conifers, which are monoecious, junipers are dioecious, i.e., having separate male and female individuals. The females bear highly modified cones that, having fleshy and fused scales, eventually look quite berry-like. Here’s Ms. redcedar, growing nearby the male plant shown above, and photographed at the same time. Some of her branches bear 1-2 pairs of fleshy pink scales, at the base of which are 1 or 2 whitish ovules. See also a ripe persistent cone from the previous year; note how it corresponds to the current season’s not-flowers. The pointy edge of one of the scales is apparent. Wow. Ovulate (female) redcedar with new, and 1-year old cones. 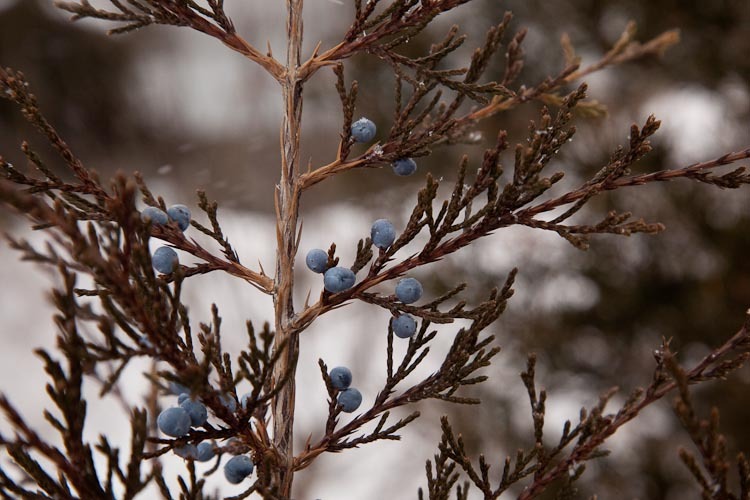 The “berries” of J. communis (common juniper, a shrubby species that occurs in Ohio, but is actually not very common) constitute the principal flavoring used in making gin. The word “gin” is derived from a modification of a French or Dutch word for “juniper.” (Like “Gin-iper.”) Juniper seed cones are an important winter food source for many songbirds, including thus-named cedar waxwings. Eastern redcedar cones are fleshy, with fused scales. They look like berries! Eastern redcedar is used for lining cedar chests, and is a source of wood for pencils. 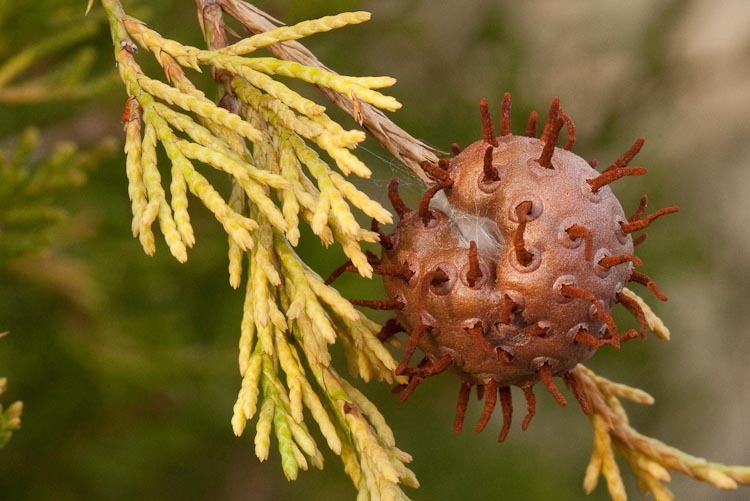 It’s also a host for a fungus called “cedar apple rust” (that would be better called “juniper-rosaceous rust”), a basidiomycete with a complex life cycle that alternates between two hosts –junipers and various members of the rose family such as apple, crabapple, and hawthorn. The spikey ball below is a gall on juniper, the means by which the fungus over-winters. The projecting horns are spore-producing structures. The spores go on to infect the rose family host, causing destructive lesions on leaves and fruits. A “cedar apple” is a dramatic spore-producing structure of a rust fungus. The fungus infects apples and related plants as alternate hosts required to complete its life cycle.